Or, a new and compendious restauration of astronomie. In four parts. 1. Logistica astronomica: Astronomicall arithmetick, shewing how to resolve the four species thereof in astronomical fractions, and to finde the part proportionall in any question thereunto belonging. 2. Doctrina sphaerica; The doctrine of the sphere, practically propounded, and applyed in all questions tending to the diurnall motion. 3. Doctrina theorica: The theorie of the coelestiall motions, representing the true face of the visible world; the proper motions of the luminaries, and other planets; and how to investigate their true places speedily, by the admirable doctrine of trigonometrie, after a new order. 4. Tabulae astronomicae: Astronomicall tables, briefly exhibiting the true motions of the sun, moon, and other planets, and their eclipses for any time, either past, present or to come. Whereunto is added, a short catalogue of all the most accurate and remarkable coelestiall observations, that have been made by Tycho, Longomontanus, Gassendus, the Landgrave of Hassia, and others. Notes: 'Wing was a surveyor, almanac writer, astrologer and astronomer. His life makes a fascinating study of the shift from belief in the old Ptolemaic earth-centered system to the new sun-centered astronomy of Copernicus. He was largely a self-taught astronomer and began, like almost all his contemporaries, as a firm believer in a fixed earth. His first book, Urania practical, in 1649 still attempted to explain the heavenly movements in terms of the Ptolemaic epicycles. By the time of the publication of the present work, he had become convinced of the truth of the sun-centered universe. He often pa...more'Wing was a surveyor, almanac writer, astrologer and astronomer. His life makes a fascinating study of the shift from belief in the old Ptolemaic earth-centered system to the new sun-centered astronomy of Copernicus. He was largely a self-taught astronomer and began, like almost all his contemporaries, as a firm believer in a fixed earth. His first book, Urania practical, in 1649 still attempted to explain the heavenly movements in terms of the Ptolemaic epicycles. By the time of the publication of the present work, he had become convinced of the truth of the sun-centered universe. He often partnered in the printing of his works with the Leybourn brothers, one of whom, William Leybourn, became a well-known writer of books on mathematics and astronomical subjects. 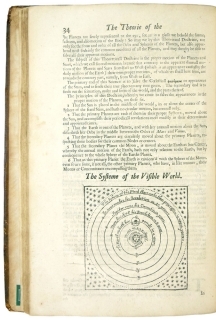 Wing shows his conversion to the Copernican system early in this volume by noting: "If we look upon the Hypothesis of Ptolomie, who supposeth an annuall motion of the Sun about the Earth, and the Earth to be the Center about whom he moves, we shall finde it most absured …"
'After describing the latest theories of the motion of each of the heavenly bodies, Wing publishes tables of all the information that might be needed by the professional astronomer. These include the latitude and longitude of major cities, the atmospheric refraction tables of Tycho Brahe, tables of motion for all the major heavenly bodies and a catalog of the major fixed stars. 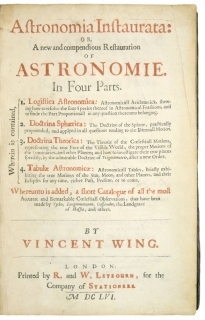 Wing's astronomical tables (here and in his other publications) were generally considered to be very accurate, and the Astronomer Royal John Flamsteed thought they were the best to be had. 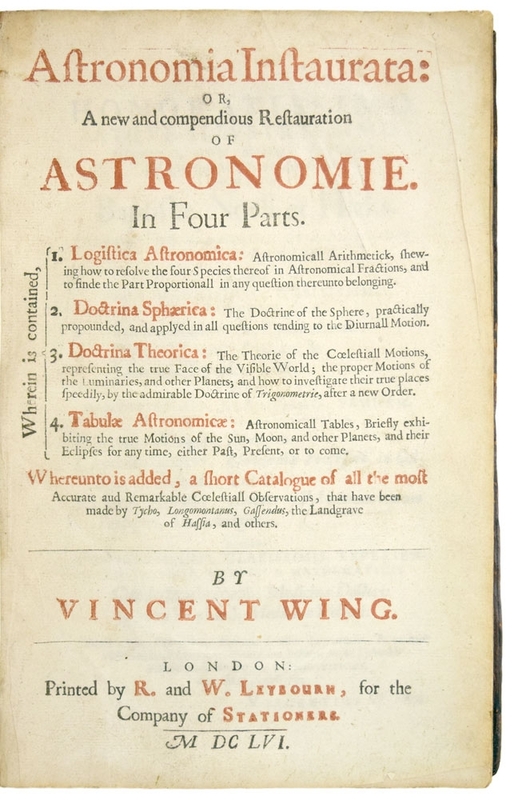 Wing ends the work with a miscellaneous collection of astronomical observations from the time of the Greeks to those of Brahe. Each of the four major sections has its own title page, but it is clear that Wing intended that they be issued as one volume. Books 2, 3, and 4 indicate a date of 1655 while Book 1 and the main title page are dated 1656—perhaps indicating when they were typeset' (Tomash & Williams). 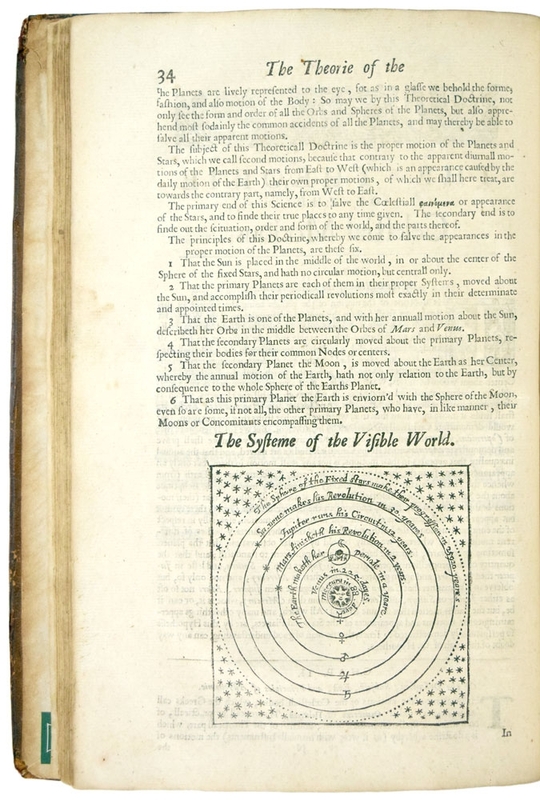 According to Houzeau & Lancaster, this is a rewritten edition of Wing's Harmonicon coeleste, or the celestiall harmony of the visible world (1651).